My experience with Premier Training has been first class. My experience with Premier Training has been first class. The tutor has been very quick to respond to any queries I have and very quick in marking assignments (1-2 days max). The course advisor has also been very quick to respond to any issues I have. Personally, I have found the Course material that has been sent to me to be very well written and structured. I especially like the exam tips/alerts, learning points which draws your attention to crucial learning information. The videos and quizzes at the end of each chapter also help to consolidate your understanding of the particular topic. The website (MyPTA) is very easy to navigate around. I like that I can access this on my tablet/phone and that it also has a chapter by chapter audio recording. The flexibility of distance learning has worked very well for me to fit around my busy schedule and lifestyle. As the course has gone on, I have certainly grown in confidence. 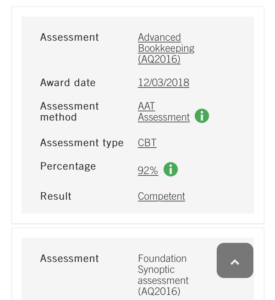 Premier Training is definitely a learning provider I would recommend to anyone thinking about studying AAT via distance learning. Excellent Value.